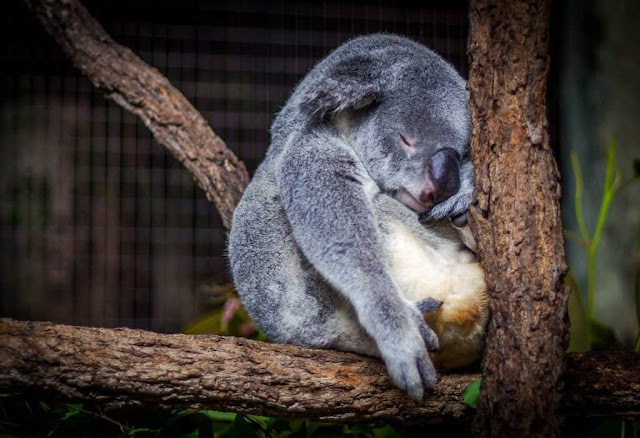 I don't think I've been this tired in quite sometime. It's been a busy day. One I didn't plan on being busy because my body, I thought was not up too it. It still may not have been, it might be that I pushed it to be but I will say I am happy with all that I accomplished today. Spring has sprung here in my part of South Carolina. It was beautiful today. Close to Seventy degrees with a slight breeze. The sky was so blue and not a cloud in sight. I took advantage of it even if my body disagreed which, now that I have finally sat down for the day I can tell you it's protesting in a big way but, I'm still happy. With my friend Bills help, he came this morning and took a whole bunch of stuff to the dump for me that has been sitting on my back deck for more than a year. Because of his help I was able to get out there this morning, look at my big planter pots and get them ready for planting my vegetable garden this year. I am attempting container gardening this year because I am praying it will be easier on my body. Once that was complete, I ran to the dollar store. The Ruby Necked Hummingbirds are finally back. I have missed them! One flew by my head while I was cleaning up and rearranging the deck this morning so I knew it was time to get some Hummingbird feeders. I had a real nice one that I paid a good bit of money for last year but, like children, they didn't like it, they liked the cheap Dollar Tree ones. So off to Dollar Tree I went. I picked up feeders and a few back ups because they tend to not last very long, they also had some really cute garden steaks with houses, and lady bugs, butterflies, and frogs on them. I grabbed about six of them. Then I went across the parking lot to Wal-Mart because I've always wanted a bird feeder. In the winter we had our huge tree on the front lawn cut back and now it looks so pretty and the birds just love being in that tree. 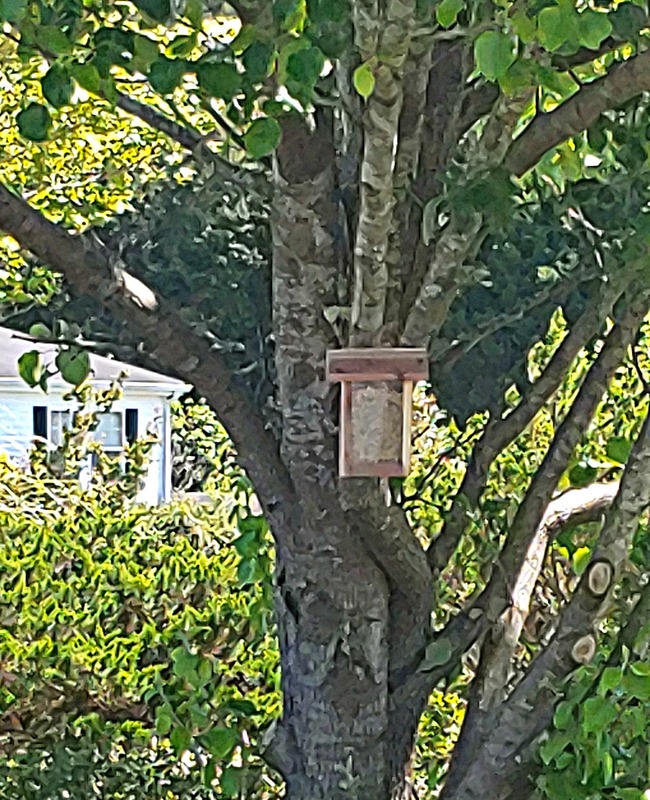 Wal-Mart had these beautiful bird houses made out of cedar wood for only five dollars so I picked one and some bird feed. Here is a photo. Not the best quality but it was hard to see in the sun. While at Wal-Mart I also grabbed a Wasp catcher as well. We have a problem in the summer with Wasps around here and last year it worked great so I definitely wanted another one. When I got home I made sugar water and hung all the hummingbird feeders, Put together the Wasp catcher and hung that. 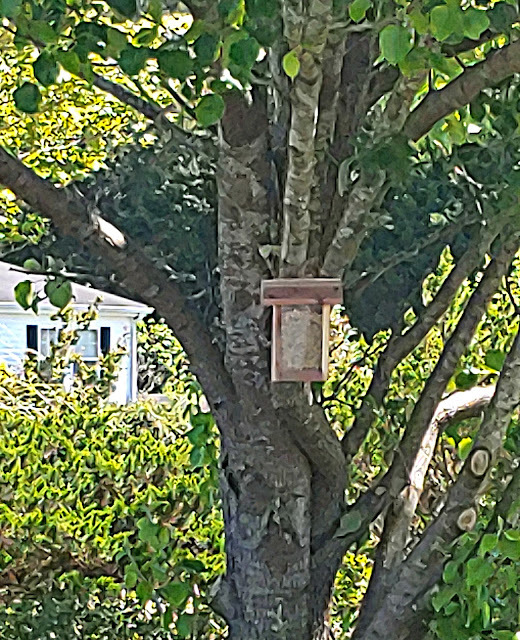 Next I went out to the front, filled and hung the new bird house feeder and put the decorative stakes around the tree on the bottom. I will take pictures another day to show you. Tonight, I sat on my front steps and cleaned out both my planter boxes that sit on the railing of my front porch. It was overgrown with so many weeds and then I transplanted the four Gerbera Daisy plants I bought last week and put a planter on each side of the railing. Doesn't take much to pretty things up a bit. There's still a ton more of gardening work to be done but little by little. My body can't do much all at once so I will do it in baby steps and hopefully be finished before the hot, hot weather sets in but can't promise that. Tonight I sat down outside on the back deck at the table doing some scripture reading and study while the hummingbirds buzzed in and out for a little meal. The breeze was so refreshing. After about an hour the sun started to dip in the sky and I was getting cold even with my sweater on so figured it best I come in and relax which is what I'm doing now. After I post this I am going to turn on Amazon Prime and continue to binge watch the Walton's. Yes, I love the Walton's.. Times were hard but they were so much simpler. Oh, how I long for the simple days of life. Getting out and getting things done is good for the soul and your body will recover. Doesn’t sound like a lot, but for you Robyn, I know it was. I am coming to terms with the fact I am going to have some good days... and some better days, and it doesn’t matter to me, that my good days make me appear lazy and unmotivated to the rest of the world. I just don’t have the stamina like I used to. We have 4 acres of good gardening soil— but I only container garden and grow in bed boxes... it is so much easier to manage. I hope you get some good veggies out of your planters.